Full Name: Heather Dyanne McIntosh. Full Title: Career Services Advisor. Degrees: Bachelor of Arts in English from what is now Middle Georgia State and a Master of Library and Information Science from Valdosta State University. "During my time as a student of this institution, I was honored to be the recipient of the Outstanding Academic Achievement award for English majors in both 2009 and 2010. While in the Honors program I was able to present papers at various conferences, such as the Georgia Collegiate Honors Conference, the Southern Regional Honors Conference, and the Honors Colloquium. In addition to being in the Honors Program, I was also a member of the English Studies Organization and the Honors Society. 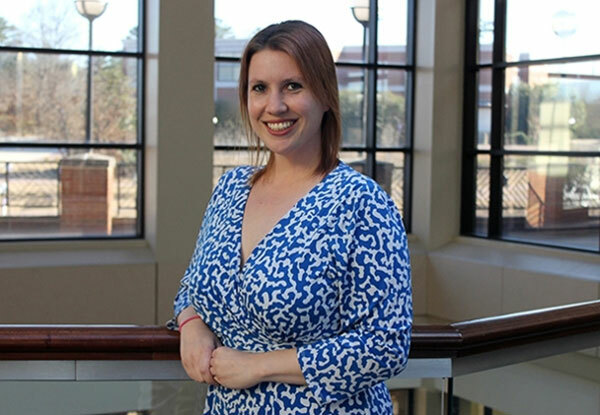 "As a staff member of what is now Middle Georgia State University since September 2010, I have had the pleasure of working in two different departments, first in the Foreign Language Resource Center and then in Career Services. In my current position I received an honorary membership to the National Society of Leadership and Success in 2014 because of the work our office did with that organization as well as the 'Unsung Hero' award at the 2017 MGA Student Affairs Conference. I think our office has certainly thrived over the past couple of years, but that is due mostly to our amazing director, Dr. Melinda Moffett. We re-launched the Professional Closet, which is a donation-based clothing closet initially started by the School of Education that is now housed in our office where anyone who is a part of the MGA family can build up their professional wardrobe at an affordable cost. "Our department also works with various programs in the community, such as GeorgiaBEST, where we have conducted workshops for high school students on topics such as time management and communication skills, and the Middle Georgia Consortium, which has sent representatives to campus and worked with our students to assist with their funding as they pursue their degrees. These are just a couple of community resources we have worked with and we always try to find new ones that will benefit MGA students and alumni as well as future Knights!" "Honestly, after I graduated, the excitement wore off after a couple of months and I truly missed going to class and coming to campus every day. It was my good fortune that a few months after I graduated I was asked by former professor if I would be interested in interviewing for a job in the Foreign Language Resource Center. It felt like home to come back here. I was already familiar with the students, faculty, and staff, so my transition from student to staff felt comfortable and I was excited to be able to stay here in a different capacity and be able to give back and help students and alumni get one step closer to achieving their goals." "Not only do I have some amazing co-workers I am happy to call my friends, but I have also created great friendships with students as well. Our office has such wonderful interns, volunteers, and student workers. It would be hard to do as much programming as we do without their help and having them around also creates a fun, exciting environment that I am happy to be able to work in. "Another great perk of working here is the Tuition Assistance Program (TAP). This program will pay for the education of any full-time employee of MGA and I was able to obtain my master’s degree while working here through this program. I plan to also pursue a doctorate degree and hope to use TAP for this endeavor as well." "Being proactive and motivated are the keys to being successful both during and after college. We see a gamut of students and alumni in our office, but the ones who come to us early on in their freshman or sophomore years and make frequent appointments throughout the rest of their time here to update their resume, brush up on their interview skills, or attend our workshops - they are the ones who usually also come back and let us know of the wonderful internships or jobs they were able to secure right after graduation. One thing students should strive for during their time in college is to graduate with a resume full of the wonderful accomplishments and achievements they were able to obtain while being here. If a student has that, then they are very likely to succeed in whatever career path they are pursuing." "Those who have met with me and worked with me usually assume I am an extrovert since I can seem very energetic and outgoing, but really, I am very much an introvert. I still get nervous being the focus of attention in group settings, whether speaking at orientations or doing a class presentation. I may be able to push my nerves aside, but trust me, I am definitely shyer than meets the eye!"